She has caressed the hearts of many music lovers through her evergreen melodious voice. Her voice never seemed to have grown older though the dame aged gracefully. Lustrous as her melodies this singing legend’s amiable nature is as well loved as her music. 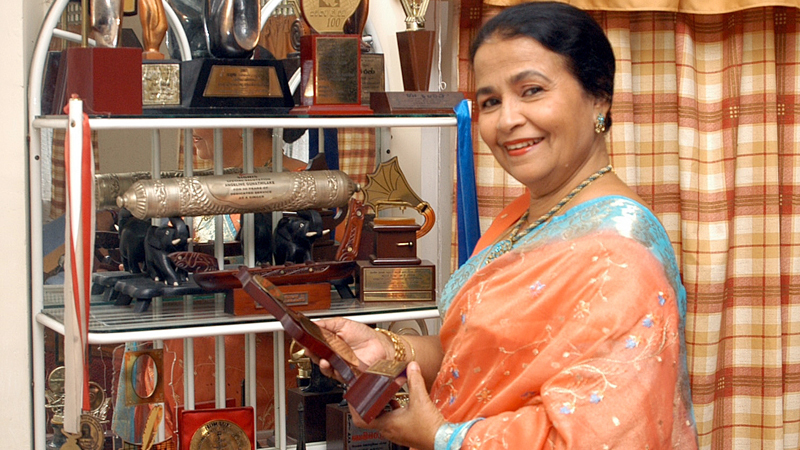 Seasoned playback vocalist Angeline Gunathilake passed away at the age 79 recently after receiving treatment at the National Hospital in Colombo for a span. Her remains now lie at her residence in No 39/3, Pagoda Road, Nugegoda. The last rites of the artiste will be held at the General Cemetery Borella on Tuesday, April 2 at 4 p.m. Known as the songstress with the golden voice this legendary vocalist was the most sought after playback singer of the golden era of Sinhala cinema when the duets she sang with H R Jothipala became instant hits and helped to uplift the film industry. She started her singing career through SLBC’s (Radio Ceylon) Lama Pitiya when she was 13. She was known as Angeline de Lanerolle then. Her inimitable voice was noted and she took part in and won many singing competitions. One such competition halped make her mark in the movie scene when she was given the opportunity to sing a duet for the film ‘Sohoyuro’ produced by S M Nayagam. Her first film song was ‘Adara Ambare Alokaya’ which she dueted with Sydney Attygalle. She gifted many songs to the music scene and many of them are still a the top of the charts and enjoyed by music lovers across the world. ‘Sulang Kurullo’ with Haroon Lantra is one such hit. ‘Miyuru Pem Madirawe’, ‘Pata Podak Thilakala’, ‘Pemwathiyanne’, ‘Ira Sanda Wandala’, ‘Sudu Pata Meedum’, ‘NiIsansalai Seethai’, ‘Kalak Thisse’, ‘Hada Guwanthalawe’, ‘Jeewanaye Meewanaye’, ‘Meedum Gala Kande’, ‘Hada Viman Doren’, ‘Amara Pem’ are some of the songs which shot her to fame and made her a star in the music world. She had recorded over 5,000 songs. She hails from Matara and was the seventh child in a family of 10 children. A product of St Mary’s Convent, Matara, and S. Thomas’ College, Kotte, she took up studies in music under the veteran musician Sunil Santha. She married Lesley Gunatilake in 1966. The couple had two daughters: Milani and Dilshani. Though both girls did not follow their mother’s path into the music field Dilshani developed a passion for Western music and excelled in the subject. An amiable personality, Gunatilake is always ready with s smile or a few pleasing words for all those who know her and her fans. She has also been into charity work for children in need.